Nick Mancillas is thrilled to be participating in Sonoma County Art Trails October 13-14 and October 20-21, 2018! Presented by Sebastopol Center for the Arts, Art Trails is an annual event, and a terrific opportunity to enjoy the abundance of creative talent Sonoma County has to offer by visiting the professional studios of the Art Trails artists. Along scenic corridors and country roads, visit the working studios which will be open to the public 10am to 5pm on each of those four days. 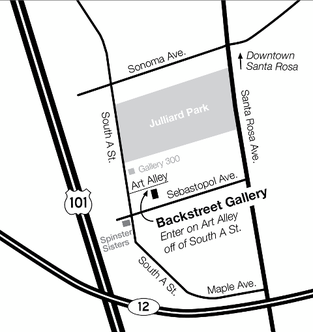 Our studio is located in Backstreet Gallery in Santa Rosa, in the SOFA Arts District. Park near Chroma Gallery at 312 South A Street, Santa Rosa. Walk down Art Alley behind Chroma Gallery to the big Picasso mural. You’re there! 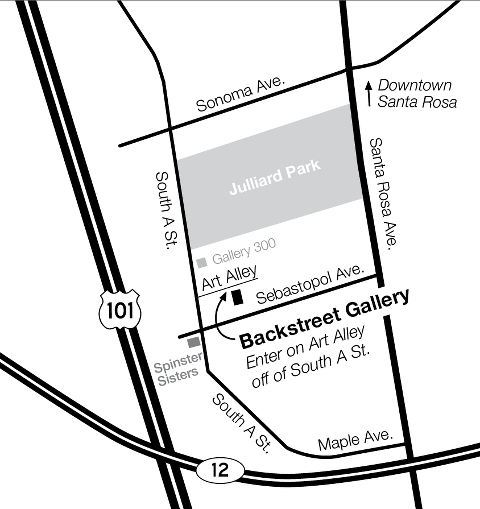 If you are using an iPhone or Google Maps, please use 312 South A Street, Santa Rosa, then follow the directions above.